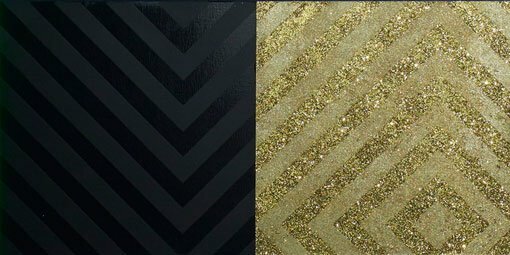 Visitors to our Yiribana Gallery of Aboriginal and Torres Strait Islander art are being spellbound by the glowing fluoros and glittering metallics of Reko Rennie’s No sleep till Dreamtime , and we’re thrilled that this work has now been acquired for the Art Gallery of NSW collection. If you find yourself dazzled by the neon sparkle but don’t ever want to look away – we have just the thing! The Gallery Shop is now stocking limited edition Reko Rennie sunglasses produced with Australian company COLAB and incorporating some of the distinctive elements found in his amazing large-scale artworks. 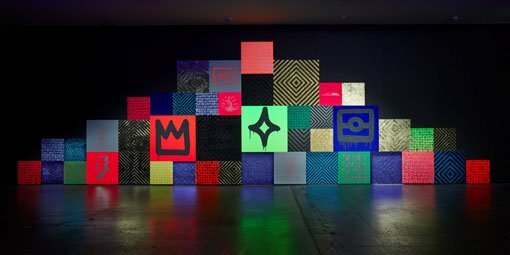 Rennie, an Australian interdisciplinary artist whose art explores his Aboriginal identity through contemporary mediums, fuses traditional Indigenous Australian designs with urban graffiti culture. The Gallery exhibited his installation Black Magic in 2010, and the mesmerising diamond patterns it featured are also found in No sleep till Dreamtime . These patterns – representing Rennie’s Kamilaroi people – are referenced in the designs along the arms of the sunglasses, and in the gleaming gold accents. COLAB works with different contemporary artists each season to create striking, unique eyewear, and only 1000 of each style are ever produced worldwide. Made by hand, each piece is numbered and comes with a hard case and a soft lenscloth case, also designed by Rennie. The glasses have polarised lenses, and they are all beautifully crafted and balanced. The perfect piece of on-your-face art for this summer – fine art style meets street art cool. You can hear more about the No sleep till Dreamtime installation at the free artist talk on 5 November, where Reko Rennie will discuss his latest work and art practice. 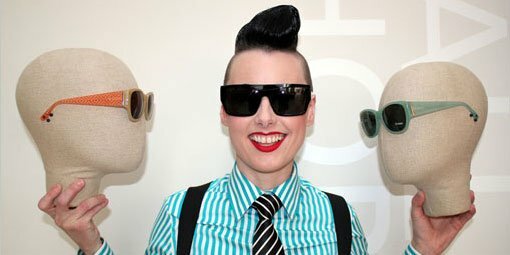 In the meantime, we’re putting forward a motion for his sunnies to be the new uniform for Gallery Shop staff – all in favour say eye!